Legendary game designer Shigeru Miyamoto has discussed Mario’s portly physique during the latest edition of Iwata Asks, that focuses on recent Nintendo 3DS release Steel Diver no less. Miyamoto explained that his less than athletic appearance was a necessity to ensure the technology in the Nintendo Entertainment System (NES) was able to detect when the player stumbled into walls. 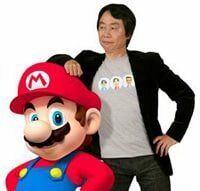 “The reason Mario is a plump shape is because gaming devices at that time could only read collisions between square boxes, not because I wanted to make him cute,” Miyamoto reveals.